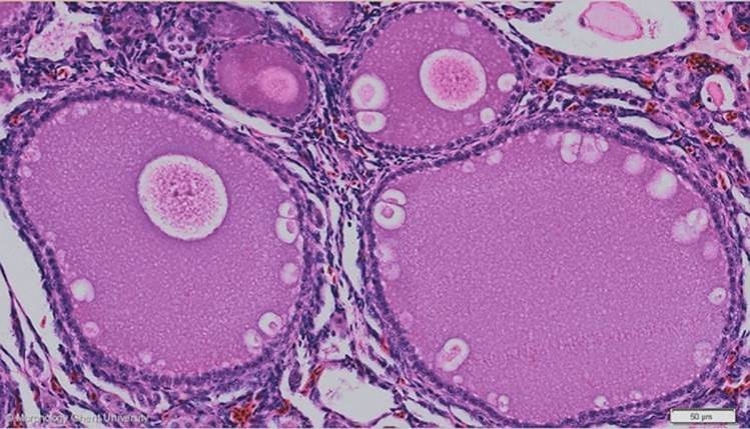 Each follicle consists of a central oocyte (primary oocyte) surrounded by a follicular wall. In the cytoplasm of the oocyte yolk gets accumulated, together the ovoplasm. During the process of maturing, no fluid-filled anthrum is formed as is the case in mammals. This is why the developing stages in birds can not be classified as primary, secondary or tertiary follicles. In young follicles, the follicular wall consists of only the stratum granulosum, a simple flattened to cuboidal epithelium. At the inside, this layer is lined by the perivitelline membrane (lamina perivitellina) (not visible under a light microscope). On the micrograph above, the theca folliculi is just starting to develop.